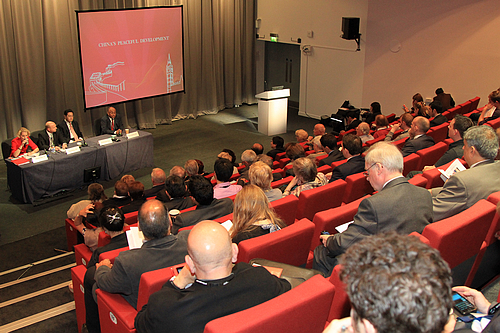 On September 26, the Chinese Embassy held the third “China Forum” at the venue of the Labour Party annual conference in Liverpool. Minister Qin Gang delivered the keynote speech at the Forum entitled "China's peaceful development". The Forum was presided over by Mark Hendrick, Labour MP and Chair of All Party Parliamentary China Group, and was attended by Liam Byrne, Labour's Shadow Work and Pensions Secretary, and Emma Reynolds, Labour's Shadow Foreign and Commonwealth Office Minister. Also present were about 100 Labour Party members and those from all walks of the society. In his keynote speech, Minister Qin introduced the meaning, objective and significance of China's path of peaceful development. In response to the three doubts about the peaceful development, he explained that China's peaceful development is not an empty talk and is consistent to China's history and culture as well as the trend of times; it is not an expedient but a long-term strategic choice to be tested by history; and it is not an expression unmatched with actions but a long-term development plan and guideline which is deeply rooted in China's foreign and domestic policies and has become a national will embodied in the broad social practice of the country's development. China has the confidence, patience and determination to let facts speak for themselves. Time will tell that China’s peaceful development is a path that fits in well with China’s needs and is for the common good of the world. Minister Qin commended the contribution of the Labour Party in recent years in promoting the development of the China-UK relations and hoped that the Party would build on this proud tradition, encourage an objective and rational understanding of China among the British people, help build understanding and support for China’s peaceful development and continue to play an active role in promoting the development of China-UK relations. Mr. Byrne said that China and the UK have great potential in economic and trade cooperation. As a country believing in free trade and opening up policy, the UK welcomes more investment from China and is willing to push the EU to recognize China's full market economy status. The UK hopes to strengthen the cooperation with China on international affairs and work with China to promote the resolution of global issues such as climate change within a multilateral framework. The most important bridge between the two countries is cultural and educational exchanges. The UK needs to create a good environment to attract more Chinese students and encourage British young people to study in China for a better understanding of the country. Ms. Reynolds said that she was deeply impressed by China's dynamic economy and society during her first visit to China last year and admired the great achievements made by China within just 30 years. She agreed with Minister Qin that in the era of globalization, countries should end zero-sum game, abandon the Cold War mentality and work together to seek win-win solutions. China's development is an opportunity rather than a threat and the UK should take full advantage of this opportunity to achieve mutual benefits and a win-win scenario for both countries. Mr. Hendrick said that China has been a peaceful country in its history of over 5,000 years of continuous civilization. Today, the country is playing an increasingly important role in the world politics and economy and China's development has become the most talked about topic. The world should welcome the rise of China. 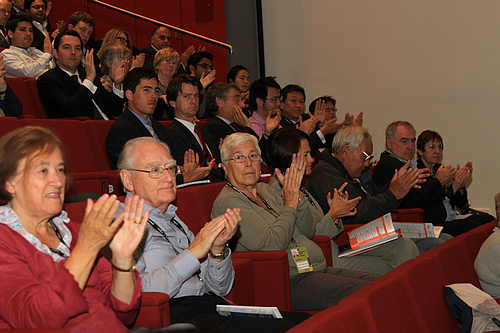 The audience enthusiastically raised questions in a friendly and active atmosphere. Minister Qin answered questions on China's regional development, religious freedom, China-UK cultural and educational exchanges, cooperation on climate change, trade union exchanges, etc.